When they were going into ninth grade Kate and Laura O’Neill’s parents told them they should go out for a sport. After all, middle school was over and it would be a great way to meet new people in high school. “We weren’t very good at ball sports,” says Laura. “So we went out for cross country.” The fact is the twin sisters didn’t like cross country very much the first few weeks. “It took us a little while before we actually started to really enjoy it,” says Kate. Thankfully for their Milton High School teammates in Milton, MA they did. As sophomores Kate and Laura helped their team win the state cross country title. They would repeat that feat two years later as seniors with Kate finishing 3rd and Laura 6th at states. In addition to those two team state cross country titles, both have fond memories of winning the 4x800 relay at states their senior year. “It was so great winning that. I love relays,” says Laura. “It was probably so special because I knew I wouldn’t be running many relays in college.” Laura finished her high school career with a 10:09 best in the 3000 while Kate liked the mile better running 4:57 by the time she graduated. In her junior year she won the state mile title. They certainly accomplished a lot running only 15-20 miles per week – a distant memory from the 80 miles per week they have worked up to as professional athletes. When it was time to start looking at colleges they didn’t know if it would be best to go to college together. Regardless, it was Laura that decided to apply early decision to Yale. “When I dropped my application in the mailbox I knew it was the right decision,” she said. Then during the 11th hour, just before the deadline, Kate followed in Laura’s footsteps and decided to apply early decision too. As professional athletes Kate and Laura have become even better runners. Laura has set personal bests in the 5000 and 10,000, as has Kate. 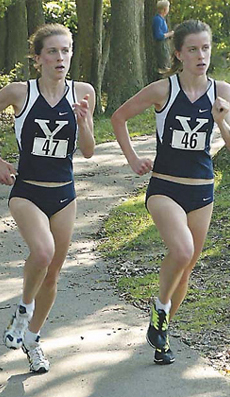 Both qualified to represent the U.S. at the world cross country championships in 2004. At the 2004 U.S. Olympic Trials Kate finished third and Laura seventh in the 10,000. By virtue of her third place finish and already possessing an Olympic “A” standard Kate qualified for the Olympics in Athens. How did it feel being an Olympian? Kate sums it up as no one except an Olympian could possibly ever understand by asking a few questions. “Do you remember when you were a kid and you anxiously awaited your birthday? Remember the excitement? Do you remember when your birthday came and it wasn’t really all that you expected? Well, the Olympics was above and beyond anything I thought it would be. It was amazing.” So what does Laura think about her Olympian sister? “I was so happy she made the team and honestly, training with Kate makes me a better runner.” They both say they are each others best friend. Kate and Laura O’Neill will speak at Aim High Running Camp Monday August 8.